Having students fill out “Book Slips” to staple to our bulletin board to showcase popular titles. A few students would add some, but no one ever really checked out the board and it quickly blended in to the background of the classroom. FAILED. Creating a class website where students could post summaries and lists of popular titles. Students who already loved to read added posts, but it wasn’t inspiring new readers. FAILED. Then I turned to my go-to strategy: adding competition. What I created was a system that has been a huge incentive for independent reading. I call it Battle of the Books. Cheap plastic containers (one for each class) with slits cut into the top. Don’t even spend your precious time decorating them – let one of your students take it home to design it! I bought this holder in Target’s dollar section to create a portable Battle of the Books station. At the beginning of the year I explain the premise to my students: They will be competing against my other classes for a chance to win a quarterly party. How do they win? By reading! 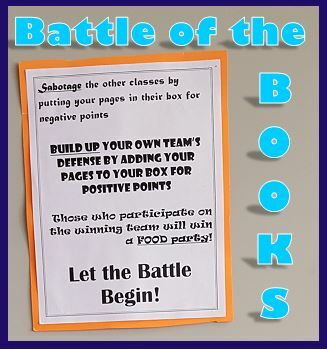 I created Battle of the Book slips that can serve as bookmarks for students as they read independently. Whenever they finish, they must fill out the front and back of the slip. Then, they add it to the box of their choice. If they add it to their class’s box each page counts as a positive point. However, they can also sabotage other classes by adding it to the other class’s box where each page counts as a negative point! Get the whole school involved by having all language arts classes compete and having the Turn-In station in the cafeteria or main office! The students absolutely LOVE that they get a chance to sabotage the other classes – don’t be surprised when they all start creating their own battle plans. Also, using colored slips is a great way to immediately organize the slips by Positive Points and Sabotage Points. I make sure to inspire even my most reluctant readers by only allowing those who submit a slip (either to their box or to another class’s) to participate in the party. Everyone tries to read a least one book because they all want to participate if their class wins! Try this idea on your own, or purchase my printables here!